How easy is it to be a better man? Jimmy has it all: a fast car, his choice of beautiful women and a thriving drug business in Marrickville. His God fearing Greek migrant parents are proud as they believe their son is running a legitimate Book Shop. Jimmy is rocked by the return of his childhood best friend Ricky who is back from America to make his professional Tennis debut at the Australian open. As the two men try to rekindle a once unbreakable friendship, Jimmy does the unthinkable and dates a bohemian “Newtown” chick and expands his drug dealing business in an attempt to become “champion” of his trade. However, he ignites a territorial war with rival drug dealers. Better Man is an exploration of the negative consequences of ambition. The need to prove ourselves to our fathers and to metaphorically “kill” them so we can have our own lives. That true peace only comes when we can motivate our success from our own passions rather than the overbearing expectations of parents, friends and society. Alex has written a very real and moving play about a modern day family and its inner workings; you experience what the protagonist Jimmy does to achieve acknowledgement from his parents. Go see this play. You walk away from it feeling like you have witnessed a friend’s plight. Originally developed as a feature film script and then redeveloped into a stage production, Better Man had the unenviable task of being our first production after the original Alex and Eve. 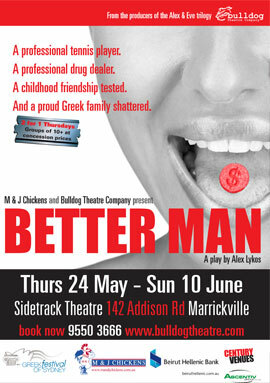 Performed from the 10th – 28th of October 2007, Better Man examined the difficulties young adults face trying to navigate to their place in the world and featured a quality cast of experienced actors and newcomers, some of whom would go on to feature in other Bulldog Theatre Company productions. As a more serious production when compared to Alex and Eve, the play got off to a slow start but once word got round about the quality of the story the sold out signs started coming out and the play was extended to fulfif demand. The Sidetrack Shed Theatre in Marrickville was the location for the third play from the Bulldog Theatre Company and for a two week run with shows on Wednesday – Sunday. The run was extended due to demand.